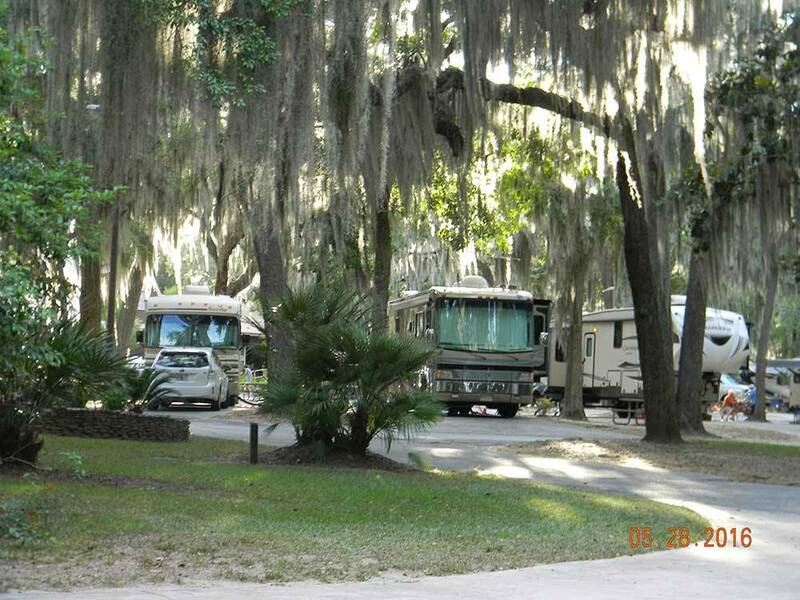 I-75 (exit 5) EZ Off/On - A Majestic canopy of oak trees draped in Spanish Moss. Well appointed sites designed for big rigs & tailored to accommodate 70' and up. Wild Adventure, Golf, Shopping & Restaurants just minutes away. Wonderful stay. Easy to find. We pulled in late and the lady at the desk was very gracious. We were there in late March. We were in a large pump truck, sleeping in a tent and had no problems getting in or out of the site. Camp site was nice. Overall feeling was peaceful and safe. Bathrooms and showers immaculate. If we are ever in the area again this would be my first choice to stay at. I would recommend this place highly to anyone. We stayed here for one night in May 2017. I had been driving for 11 hours, was exhausted, and it was past 11 pm. 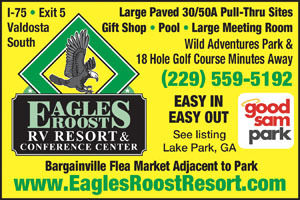 Eagles Roost is right off I75 and our space was all ready for us. It was easy to find and get into! We were set up in minutes and jumped into bed and slept like babies. There was no noise from the highway! The park is quite beautiful and the folks working there obviously take pride in keeping the park pristine! We will definitely stay there again! BEWARE! This park is NOT what I saw advertised. Sites were small, our awning nearly reached the next site. There is no cable TV provided and be sure you want to stay the entire reserved time as there is zero refunds! It is right along I-75, which means road noise and there was a black diesel P/U that toured the sites about every hour. Reason I mention this, diesel is noisy and smelly. We left after one night and gave notice before the first day was over. AND STILL... they refused any refund!!! Well... this was a lesson learned, check the fine print!!!!!!!!!!! We booked 2 nights at this campground with the idea of laying by the pool our second day to rest and relax before our days ahead of traveling. We found out AFTER we checked in the pool was not open due to they put acid in it to clean it. We also paid extra for a site that was suppose to have great Wi Fi per the lady I booked with. Needless to say, the WiFi was horrible! Wanted to check out after the first night but we stuck it out and stayed. Wouldn't stay here again though. Stayed one night on way to Florida - 11/4/16. The office staff was very nice and booked us in quickly. Though they had lost their cable server a couple of months earlier the space price remained the same. The park is filled with many trees and the droppings go on till after midnight. I had to climb up on the roof of the RV and sweep the small limbs, leaves and acorns off the slides before bringing them in. It was just turning light and I saw a squirrel on a limp about 20 feet above me drop multiple acorns at me. Lastly the turns are a little sharp for a big rig, especially when people park on the edge of the road. I don't plan on staying here again. I checked in on 12-17-2015 late afternoon in light rain after a 325 mile drive from central Alabama. This is a nice park, easy to get to from I75. Check in was very friendly and quick and I was assigned to site A15. The site was a pull through like most sites at this park. The electrical and water hookup all worked fine and the electrical passed my EMS electric test prior to plugging in. One big surprise here was the WiFi. It worked perfectly and was as fast as my U-Verse at my home base site. The park was virtually empty so the WiFi might slow down a lot if the park was full, but for this visit it was absolutely perfect at my site. All sites that I looked at are big rig friendly. I am still on my site as I write this. I will stay here 2 nights on my way south. Friendly and helpful staff. Park has many trees and is located next to a weekend Flea Market. Easy access from I-75. Office building makes you wonder what to expect because it smells very damp and moldy. We have been there twice and it was the same both times. Wi-fi but no cable. We will stop again but not on of our favorites. When traveling from middle Florida to Atlanta, this has become one of my favorite places to pull in for the night. The sites are large and very accommodating. The staff is always friendly. Paid about $31.00 with GS discount just a few weeks ago. Have been here 3 or more times. Located just down the road from the outlet mall, across from Camping World and lots of places to eat. Nice walk up the street to the outlet mall, etc. Right off the interstate and at the Fla-Ga border (5 miles from the stateline). Good quick in and out if that is what you want. Try to use this as a stopping place when traveling north and south. Thank you for your kind review. We strive to make each and every guest happy.